This is one of those times I wish we had smellovision through the screen because I am particularly fragrant today. You’ll have to take my word for it. 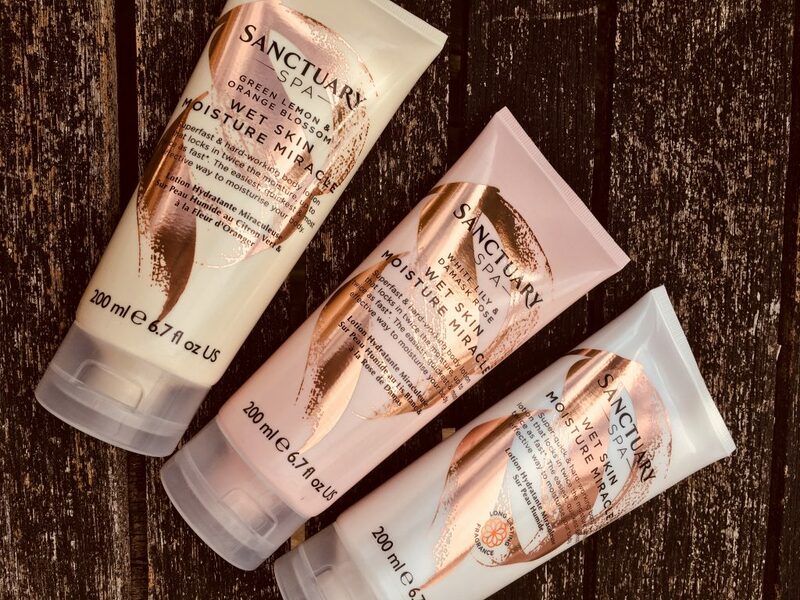 The reason behind my extreme fruitiness is that I was so excited to try these Sanctuary Spa products out that I used them all in the same shower. So now my top half smells lemony, arms are kind of floral, and I’m rosy from the waist down. This will now be my signature scent. If I meet you I’ll give you a sniff. I do like using lots of products in the shower. Life’s too short for only one shower gel at a time, don’t you think? This body lotion is a bargain product for lazy people who like to have soft skin that smells nice, so naturally it’s got my name written all over it. The USP of Wet Skin Moisture Miracle is that you can use it straight on to wet skin whilst you’re still in the shower, and it will sink in straight away. So no hanging about waiting to dry before applying body cream, and no waiting for your cream to absorb. The packaging is in lovely sugared almond pastel shades with rose gold accents. It really does feel like treat. (BTW just at the point my children stopped doing that, the cat learned to open the bathroom door. THE FECKING CAT! This is why I need to save time in the bathroom. Dennis the Cat is in next). The fast absorption means that it’s got a thinner texture than you might expect from a body cream. It’s more like facial moisturiser, but because you’re applying it to wet skin a little goes a long way. But it was all absorbed by the time I’d brushed my teeth this morning, so it all felt very time-efficient. The scents are 100% delicious. My favourite is the Green Lemon & Orange Blossom which is bursting with zingy citrus freshness, and just the ticket to wake you up in the morning. Other scents in the range include White Lily & Damask Rose (fresh and floral) or the classic signature Sanctuary ‘floriental’ blend. They’re all quite delicate scents, not at all overpowering. They leave the skin lightly fragranced and feeling soft. 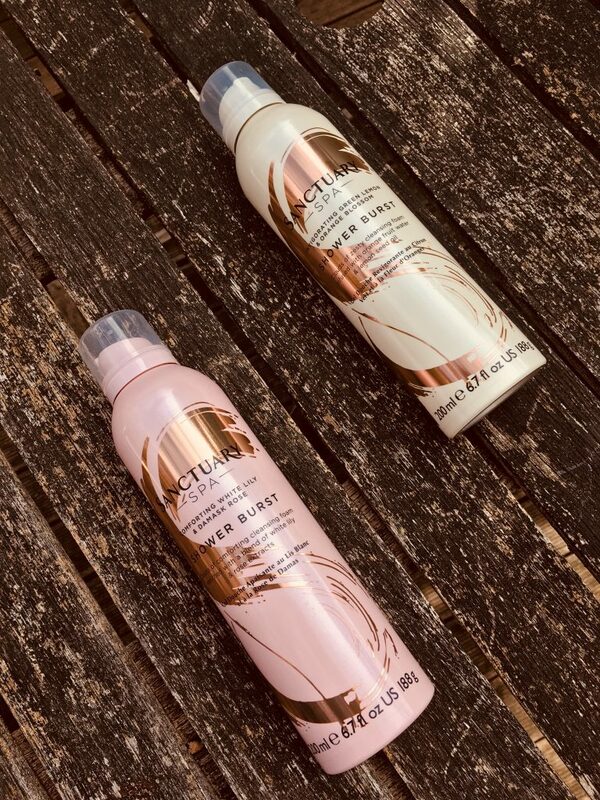 Sitting along side these in the range are the Sanctuary Spa Shower Bursts, a wonderfully soft gel to foam cleanser in the same fragrance range. 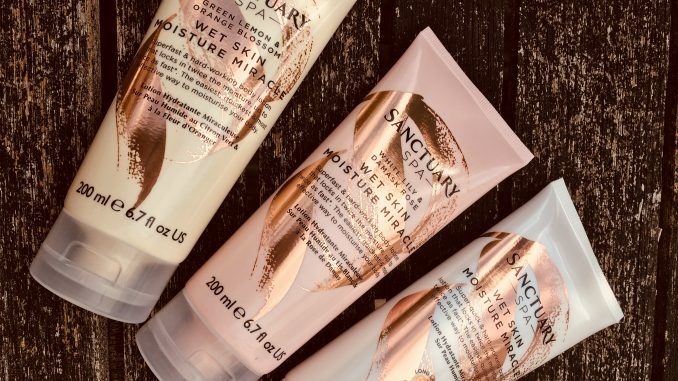 The Sanctuary Spa range is available from Boots. including Wet Skin Moisture Miracle (200 ml, RRP £8) and the Shower Bursts (200 ml, RRP £7).